What secrets are hidden in this old photo of 3 Scottish women? 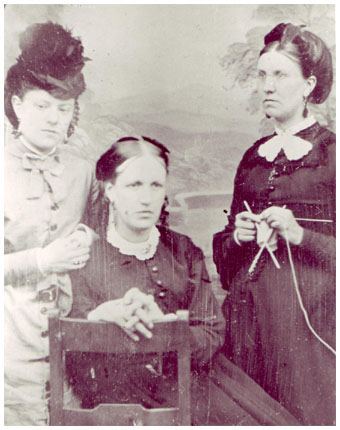 '"Please find attached an old photograph of three women. It is a glass plated photograph – perhaps an ambrotype – in a framed case. The scratches on the image are from the negatives when I photographed many years ago with film! Any dating based on the clothing would be great. The photograph would have been taken in Fife, Scotland". "Ambrotypes, as you point out, are photographic images on a glass plate and are often mounted in a frame or presented in a hinged case. Most ambrotypes taken in photographers' studios date from the later 1850s or early 1860s, being rapidly superseded during the 1860s by the new card-mounted carte de visite photographs, although outdoor ambrotypes may date from as late as 1890. If you are correct about the format of this photograph, then it is a relatively late example of a studio ambrotype, dating from the 1870s. Dress clues invariably provide the best evidence for the timeframe of an unidentified photograph and the appearance of young women, like these pictured here, generally offers the most accurate dating clues. Female fashions in clothing and hairstyles changed regularly in the past and the up-to-date modes favoured by young women in particular can provide a very close date range. Here we see three female ancestors, the girl in the centre the youngest figure here and probably aged no more than 14 or 15 years old, judging from her juvenile hairstyle showing the hair dressed in youthful ringlets. The standing women (possibly the girl's older sisters?) wear adult fashions, their elaborate hairstyles typical of the 1870s. The drawing back of the hair off the face during the later 1860s and 1870s inspired the vogue for long pendant earrings, as worn here, while the height of many 1870s coiffures necessitated the wearing of neat hats tilted well forward on the head, as seen on the left. This lady looks especially fashionable and the style of her dress, buttoned down the centre-front, suggests that she is wearing the narrow 'Princess' dress that followed the elongated cuirass line. Introduced around mid-decade, this new silhouette replaced the early-1870s bustle shape and helps to date this photograph to c.1875-79 – a close timeframe that may help you to positively identify these ancestors. Another interesting feature of this picture is the knitting! Photographs depicting women and girls (and, occasionally, men) knitting by hand date back to at least the 1860s, for knitting has a long history in Britain, being especially associated with fishing communities that produced traditional fishermen's ganseys. This embryonic garment, however, is no sturdy blue seaman's jersey, but a delicate white or pale-coloured article taking shape on small needles – a baby's garment, perhaps? Looking at the lady occupied with her knitting, she appears to have a pronounced 'bump' below her waist, strongly suggesting that she is pregnant and might therefore be preparing her unborn baby's layette. This kind of subject is rarely seen in family photograph collections and adds a fascinating extra dimension to this scene. Got a photo mystery you need help solving? 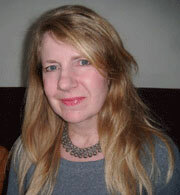 Findmypast First members can enjoy an exclusive discount on Jayne Shrimpton's photo-dating services.